So it happened: The Great Dognapping. 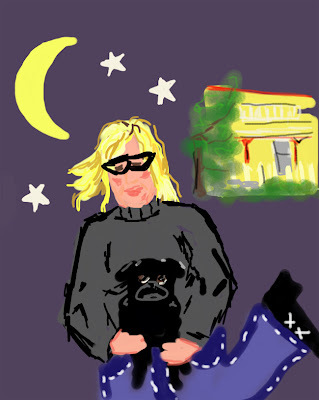 At midnight last night, I smuggled Waffles out of Pugdom, my friend Joan's house in Warren, VT. As far as dognapping's go it was a great success. I managed to nab my pug and make it out alive. Of course, I must admit that Joan was privy to the whole escapade, in fact she even suggested it. She finally relented to letting Waffles be mine, but informed me that I would have to sneak her out of the house when she wasn't looking. So, I did, kind of. But Joan had given her a bath, cut her nails, and packed a bag of dog food and snacks for her. Still, I snuck off into the dark in a mad dash for my car, carrying Waffles and looking back over my shoulder in case Joan changed her mind. She hasn't and Waffles is home with me now, snoring away on the sofa. She's smart! After only a half hour in my car she figured out how to slip out of her harness and her car seat. She hates crates and x-pens, so I'm not sure how to contain her and keep her safe when I'm not home and she certainly doesn't want to sleep in either. Only the bed for this little girl. She and Alfie are getting along well. Today Alfie showed off her baby swimming pool to Waffles and took great delight in hiding bones from her. We had a busy day visiting Petco for supplies, my grandmother's for a swim and my brother's where they played with his boxer, Sophie. A busy day for a little pug!